We are the proud Craft Beer Partner of the San Diego SEALS Lacrosse team! Join us for pre-game pints at our Bay Park Tasting Room. Show your ticket at the Tasting Room and pre-game with us for 20% off your entire tab! (Valid only at Tasting Room for home games, must show ticket, offer only good for one person/one ticket, not valid with any other promotions). When you join our Mug Club, you get 20% your entire tab, EVERY Monday! 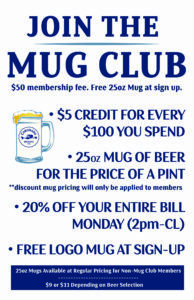 Details: $50 membership fee Free 25oz logo mug at sign-up $5 credit for every $100 you spend 25oz mug of beer for the price of a pint (discount mug pricing will only be applied to members) 20% off your entire bill Monday (2pm-close) Ask your bartender or server for more details! Valid at all three locations!